In 1995, the movie Waterworld predicted catastrophic changes to the earth’s sea levels, and painted a picture of the chaos that resulted when the water rose and society collapsed. The movie was a flop. But it got one thing right: scientists say melting glaciers are already contributing to rising sea levels, and that they’ll melt faster in the next century. Changes in the Bay Area — which has over a thousand miles of shoreline — could be dramatic. In San Francisco, some scientists say the Bay could rise as much as five feet. That would put the water line in the middle of the financial district. In Oakland, Jack London Square could be more like an aquarium. Cities around the Bay are trying to figure out how to avoid catastrophic changes, and they’ve got some novel ideas. Last year, Superstorm Sandy opened the eyes of many on the East Coast to the dangers of a rising ocean. Here in California, we haven’t had an event quite like that. But that doesn’t mean people aren’t thinking about it. 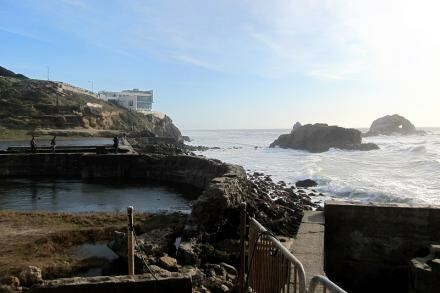 Sutro Baths: Not long for this world? Goldzband’s Financial District office overlooks the Bay from the 26th floor. He says that nobody knows exactly how much sea levels could rise and transform the view from his window. Here’s what we do know: for about 400 years, the Earth’s sea levels were actually going down. Then, about a hundred years ago, they reversed themselves began to rise. They’ve gone up about eight inches so far. That’s enough to make Ocean Beach a little narrower. Goldzband cites predictions from the State that estimate something between 31 and 69 inches of sea level rise by 2100. “So basically that means two and a half to six feet,” he says. At that rate, Oakland and San Francisco’s airports could be underwater in just decades. Tech giants like Google and Facebook, both in low-lying areas, are also vulnerable.